On a cold day in January 2016, our landscape team was planning a trip to Bracy’s Nursery in Amite City, Louisiana to pick up our carefully selected Savannah Holly bushes that were to be added to the landscape at the House of the Seasons in Jefferson, Texas. The bill was paid and a confirmation call to the owner of the nursery was made that morning to confirm all was set for pick up that day. After a brief pause of silence, the nursery owner sheepishly replied, “I rented your beautiful bushes out to be used for the Louisiana Governor’s inauguration, and they haven’t been returned yet.” It appears our landscape team knows how to pick exceptional quality. We are glad they could be of service for such an important event. In February 2016, the bushes were planted at the House of the Seasons where they continue to thrive and beautify the gardens. 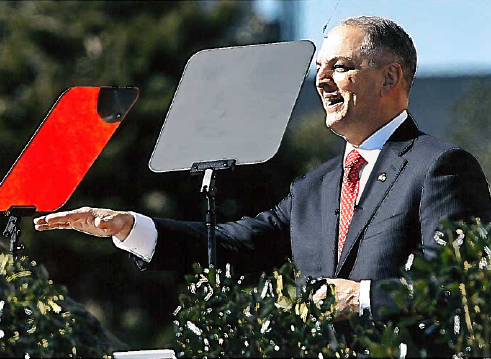 Surrounded by our Savannah Holly bushes, Governor John Bel Edwards speaks at his inauguration ceremony as the 56th Governor of the State of Louisiana. The ceremony was held on January 11, 2016 in front of the State Capitol.